Hondo II P-bass copy, it’s a bit roadworn but the neck is in a really good state and it feels great to play. The machine heads could do with being replaced too, it seems like Hondo II have great necks but cheap hardware and electronics. As I mentioned before I got a Hondo II P-bass for my colleague Verushka, she plays in an awesome punk group called Sect. The bass arrived last week and I took it home and had a look at it. It was sold as untested so I presumed that nothing worked, and I was right. The wood seems really solid and good, just like the Hondo II I got for Dani a few months back but the electronics seemed to be pretty bad. I took it a part and cleaned it, polished all the metal and then started to go through the electronics. 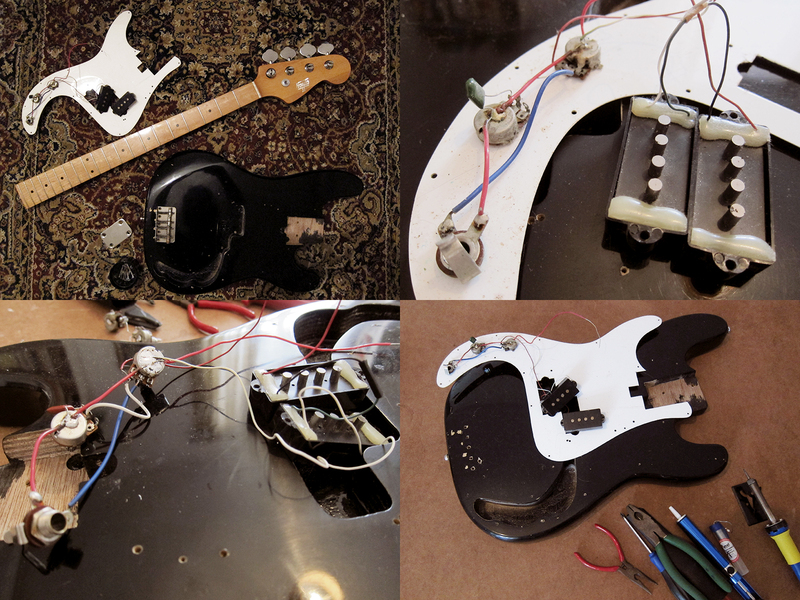 It turned out that the pickups doesn’t work. Or rather they work, but the output is so low that you can hardly hear them. We ordered a new set of Artec P-bass pickups, new pots and jack from my favourite Hong Kong store EY Parts so as soon as they arrive I can get the bass sorted. 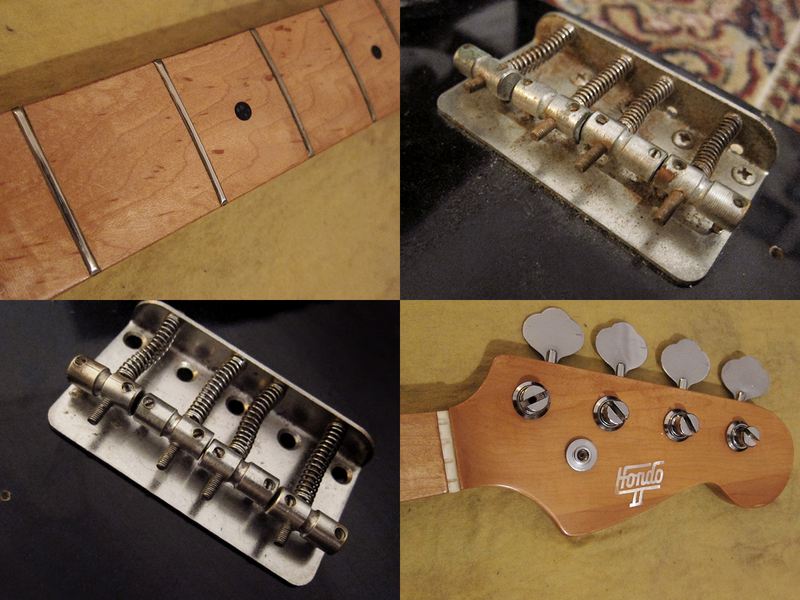 I cleaned it, polished the frets and all the hardware with wire wool and metal polish. I have to say that this cheap little bottle of Harley Benton Hardware Polish has proven to be extremely worth the 1.90€ I paid for it. I put in a little shim when I assembled it, just like I did with Dani’s and it made wonders to the action. Now it’s really low and easy to play. I took all the electronics apart, cleaned the jack, cut the ends of all the wires and replaced the mini pots with some newer mini pots I had at home, I did everything I could to make sure that all the connections would be as good as possible but it didn’t help. Well I got rid of the extremely loud humming noise that was there before but the pickups are still way too weak for being usable. Let’s see what it sounds like when the new full size pots, jack and Artec pickups arrive.